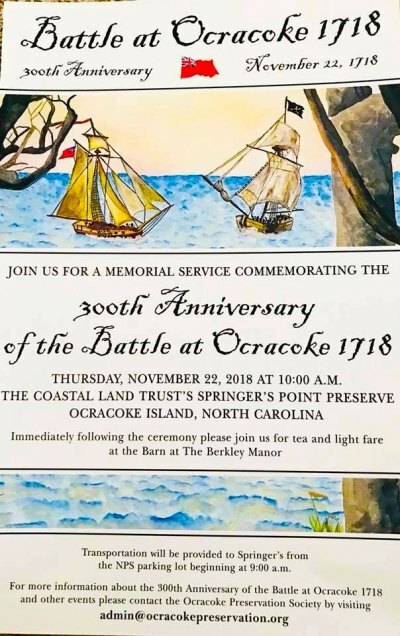 A memorial ceremony on Thanksgiving Day will honor and recognize the fallen mariners of the Battle at Ocracoke on November 22, 1718. Named by The Smithsonian as #3 of the ten anniversaries worth traveling for in 2018, the Ocracoke community will host representatives from the British Royal Navy for the 300thAnniversary celebration. The three-day event will include a memorial ceremony, tea party and music by Molasses Creek, David Tweedie and Martin Garrish and Friends. 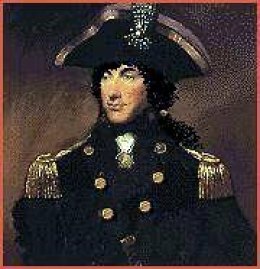 1st Lt. Robert Maynard: If Google is to be believed, he looked like this. At the Battle at Ocracoke on November 22, 1718, the Royal Navy, under the command of 1stLt. Robert Maynard, defeated the pirate Blackbeard in the waters off Ocracoke Island. Much ado is made of Ocracoke’s piratical heritage, but little is acknowledged about Maynard and his men, eleven of whom are buried on Ocracoke. Islanders have recently learned their identities. Also, officers from the current HMS Ranger and the Sussex Universities Royal Navy Unit from the Royal Navy officer training unit who train aboard the HMSRanger, named for Maynard’s ship will be in attendance. This unit holds their most formal dinner of the year on November 22nd, to celebrate Maynard’s defeat of Blackbeard.